Our training allows the end user, from the operator to the system administrator, to maximize the use of the Security Computer System. The courses are effective, practical, and hands on sessions designed to get you and your personnel up and running quickly with your new system. Our offerings address all plant personnel involved with the system and include courses for operators, system administrators, hardware maintenance personnel, cyber security administrators, badging personnel, and graphical interface designers. The standard in-house training addresses the standard AIM System. Courses can be customized for customer-specific systems. Our trainers are experienced professionals and are both engineers and recognized subject matter experts. They have a passion for teaching and sharing their knowledge to our end users. 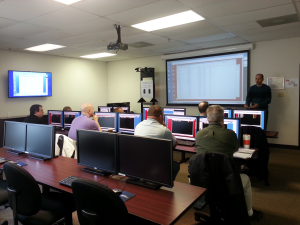 The courses are offered at ARINC Facilities in Pittsburgh (PIT), PA and Carrollton (CRL), TX and at customer locations with Maintenance Training System (MTS) available. Training is appropriate before and after system installation. Email training@arinconservice.com for additional details and scheduling.